Jojoba oil, commonly known as liquid wax, is derived from the seeds of the jojoba plant (Simmondsia chinensis), also known as coffeeberry, goat nut, deer nut, pignut, wild hazel, quinine nut and gray box bush. These plants are native to the Sonoran Desert in the American Southwest and Northern Mexico. Although jojoba is called an oil, in fact it is wax ester and is remarkably similar in composition to human sebum, or skin oil. The jojoba plant is a small evergreen shrub, and it is used in soil conservation and landscaping in arid conditions. The seeds of the shrub are harvested for use in cosmetics, hair, skin care and various other uses. The Jojoba plant is native to the Sonoran Desert in the American Southwest. 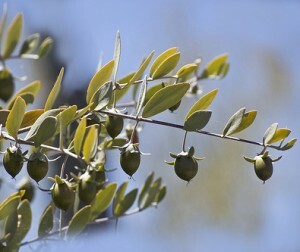 The first use of jojoba oil was observed in indigenous people in the southwest. The first planting of the jojoba occurred in 1927, with the purpose of analyzing the product and possibly manufacturing it for its beneficial uses. Once harvested, the seeds were sent to the University of Arizona in Tucson for chemical analysis. In 1935, chemists at the university discovered the unique qualities of jojoba oil. In their research they also revealed that the properties of jojoba oil are similar to sperm whale oil. Whale oil was abundant in those days, so further research into jojoba oil was abandoned. In 1969, sperm whales were put on the endangered species list. Not long after, in 1971, the United States banned the importation of whale oil into the country. An alternative to whale oil was needed, so attention turned once again to jojoba oil. The late 1970’s saw a significant increase in demand for the oil, and producers began buying land in the lower desert of the Southwest in order to plant and harvest jojoba. Today, jojoba oil is used in various ways due to the many beneficial properties that it contains. Jojoba oil is used in everything from jojoba oil for hair, to massage oil for the skin. The benefits of using jojoba oil are many. Back in those early days, research into jojoba oil revealed that it is extremely close in structure to sebum, which is a naturally occurring wax on the human skin. For this reason, jojoba oil is absorbed quickly and easily into the skin and hair. It has no toxic properties, and it is non-comedogenic and non-allergenic. Jojoba oil contains vitamin E, which has a positive effect on wrinkles. Jojoba oil is also a very potent antioxidant. It has been shown to aid in relieving inflammation, and it is even an effective way to kill bacteria on the skin. Since Jojoba oil is non-comedogenic, it is used as a moisturizer and face cream to help get crucial moisture to your skin without blocking the pores. Jojoba oil is one of the highest grade oils available for purchase. It is cold-pressed in many extraction processes, which aids in keeping all the nutrient value of jojoba oil intact and well-preserved for use. Medicinally, jojoba oil is used for its high mineral content and healing properties. Minerals such as zinc, silicon, chromium, and copper are all found in jojoba oil. Jojoba oil also is a rich source of vitamin B complex and vitamin E. It has antibacterial properties, which have been shown to help with acne, cold sores, warts and sunburns. 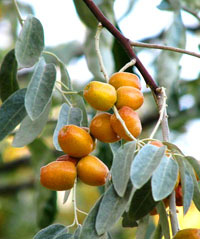 The jojoba plant, in addition to its many topical uses for humans, is a nutritious forage plant for wildlife and cattle. Jojoba shrub tends to be unusually high in crude protein and phosphorous. Jojoba oil has a high molecular weight and esters of long chain fatty-acids and alcohols. It is a highly stable substance, which enables it to stand for long periods of time without becoming rancid or volatile. Although it is considered a vegetable oil, jojoba oil is not a triglyceride fat. Grade one is a pure and natural type, with a golden or yellow color. Grade two is refined and bleached to be colorless. This happens due to a filtration process. Grade three is a de-colored and deodorized grade that is commonly used in cosmetics. Grade four is a molecular distilled grade that can be hugely expensive. Ninety percent of all jojoba oil produced is used in the cosmetic and hair industry in the form of jojoba oil for hair. Due to its similar components to sebum on the skin, it is preferred as an additive to many skin care and hair care products. Products are also built and manufactured around it. Exploring the many uses for jojoba oil shows just how versatile it is. You can mix jojoba oil with other oils and make great cosmetics products. Here are some useful recipes. Mix ingredients in a small bowl, wash you hair with a shampoo, dry off excess water on your hair with a towel, place the conditioner on your wet hair and roots for 30 minutes. Then rinse it off with warm water and mild shampoo. In the empty 4 FL. OZ. bottle mix the Grapeseed oil and Jojoba oil in a fifty percent mixture. Then add Ylang-ylang oil and Lavender oil. Mix well. This mix can be used for many things: as a massage oil, as a bath oil, you can add it to your shampoo, hair conditioner, shower gel. Jojoba oil is used in massage oils for its smooth consistency and non-greasy feeling. Jojoba oil is used in many cosmetic products, lip stick, lip balm, hair care products and facial cleansers. Jojoba oil is used frequently in aromatherapy for its long shelf life and its superior quality as a carrier oil. Essential oils are added to the jojoba oil, and then it is burned for the desired therapeutic effect. Jojoba oil has been used in soap making for decades due to its stability and long shelf life. The oil provides benefits to the skin through the soap as well. It is necessary to note that if jojoba oil is to be used in soap, it should not exceed 10 percent of the total recipe or it will produce a soft bar with poor lather quality. When used in the proper quantities, it actually enhances the lather quality of soap. Currently, studies are on-going as to the benefits and treatment of jojoba oil on seborrheic dermatitis. Seborrheic dermatitis is an inflammatory condition of the skin caused by stress and over production of sebum. Interestingly enough, some of the newest research into how to use jojoba oil has nothing to do with the hair or body at all. More and more researchers are looking into the oil as an alternative and renewable source of fuel. Jojoba crops are already being planted in some areas around the world with this purpose in mind. The largest production of jojoba oil occurs in the U.S., but that is changing as more and more countries recognize the potential in the various uses. The jojoba plant does not provide a useful product until the fourth or fifth planting, making this a commodity that requires patience and a multiyear commitment. Jojoba oil is produced by squeezing the seeds of the jojoba plant to extract the oil. It is then filtered and pasteurized for its various uses.